One thing we thoroughly enjoyed was our rental flat at Emperors Wharf so it was a no brainer to book it once again. 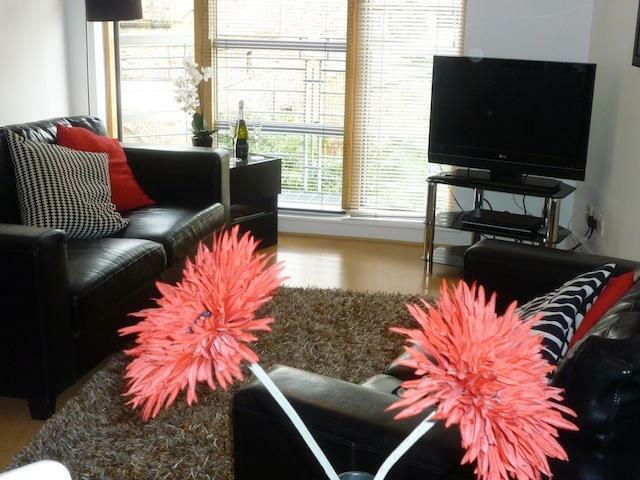 This one bedroom flat has it all, including a gracious owner who offered to pick us up at the train station. What a lovely way to begin a fun-filled week. Prior to our arrival it rained a lot. So much so that the River Ouse adjacent to our flat continued to rise until it overflowed its banks midweek. Sidewalks and pathways we would normally have used were inaccessible. And the water rose quickly. Tuesday morning John was able to walk along this river walkway. By noon the same day the water had risen to make that impossible. Beneath the water at the bottom of this staircase is a walkway to our flat. It runs all the way to the bridge in the distance, but we obviously stayed clear! 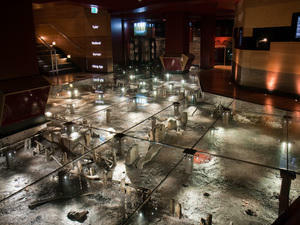 Built directly above remains of the Viking settlement this glass floor display helps bring the past to life. Part ride, part exhibit it offered something for everyone of every age. 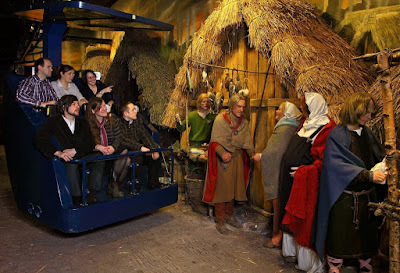 Our favourite was the digital display and recreation of a Viking woman based upon her skeletal remains. At 5'3" she had problems with her left leg that caused her to limp. 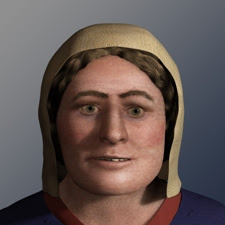 She also had 33 rather than 32 teeth and remarkably had only one minor cavity. This is what she looked like. 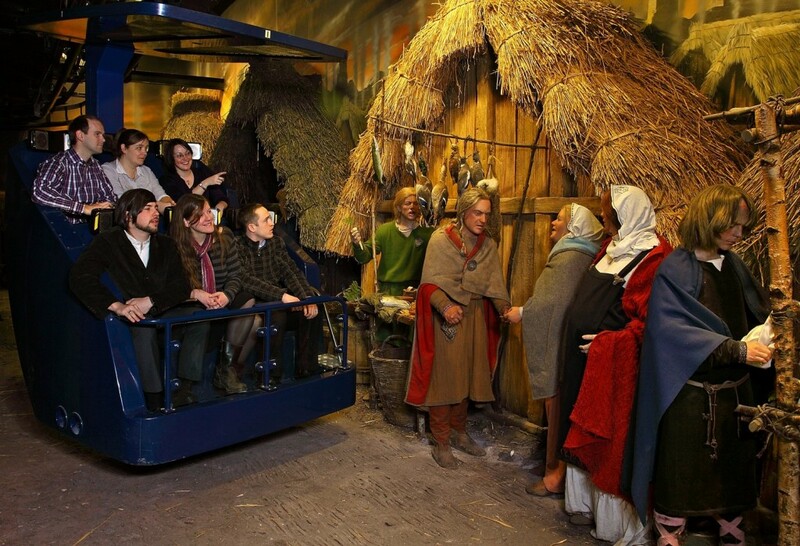 One particular memory of the Jorvik Centre I'll always cherish took place at the end of the tour in the gift shop. A little boy, maybe 4 years old, was delighted when his mother agreed he should have a toy Viking helmut and sword. He left the shop proudly wearing his new gear and I have no doubt he took them to bed with him that night! Continuing onward to York Minster. While we'd toured it last year it's worthy of multiple repeat visits. Maintenance of the Minster is a continual battle and the solution is its program to train modern day stone masons. The four year program ensures masons and carvers use the same traditional skills to maintain the cathedral as their medieval counterparts. The exhibit illustrating the techniques is informative, links the past to the present and gives us an insight into the complexity of both building and maintaining such a structure. The stained glass windows are also in need of constant care and repair and the York Glaziers Trust, the oldest and largest specialist stained glass studio in Britain, is also located on site. One corner of the Minster is dedicated to their work. This is right next to the east window that is currently being repaired. The scaffolding alone is mind boggling as we counted the equivalent of fourteen floors. Outside it is equally impressive in the scale and attention to detail. All of this sightseeing created a thirst and so we zipped inside The Three Tuns pub for a pint and late lunch. Established in 1782 it's a tourist destination in its own right! More on York to come. Stay tuned!